High School campers have an experience like no other. In addition to classic camp activities such as boating, swimming, climbing, zipline, hiking, talent show, camping/cooking outdoors, swamp canoes, and the challenge course, High School TKO campers will experience Tekoa's high ropes course, whitewater rafting (additional parental authorization required for rafting), Big Meadow Zipline and participating in a community outreach project -- activities reserved only for high school campers! Many of our high school adventure camps feature backpacking in Pisgah National Forest. These trips challenge campers physically while introducing them to some of the most beautiful parts of Western NC. Waterfalls, 360 degree views and swims in mountains rivers await! Our high school TKO camp features a day of service in Henderson County. We have partnered with Housing Assistance to provide service to much needed home repairs. We also spend time with local nursing home residents and support Given's Estate. Survivor is an experience like no other here at Camp Tekoa. You will live in a campsite all week and compete in tribal challenges. Each day ends with reflection on the experience and a campfire. High School campers have an experience like no other. Regardless of whether a High School Overnight camper has come to Tekoa before, they seem to embrace their week of spiritual growth and renewed self-confidence. They gain lifelong friendships through fun Tekoa activities and their interaction with other group members and Family Group Leaders. 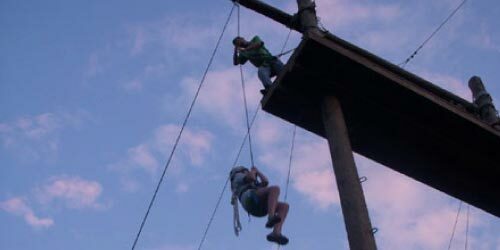 In addition to classic camp activities such as boating, swimming, climbing, zipline, hiking, talent show, camping/cooking outdoors, swamp canoes, and the challenge course, High School Overnight campers will experience Tekoa's high ropes course, whitewater rafting (additional parental authorization required for rafting), Big Meadow Zipline and participating in a community outreach project -- activities reserved only for high school campers! Camp Tekoa has a progressive overnight program, which allows campers to engage in age appropriate activities, allowing them to be challenged physically, mentally, and spiritually year-after-year. High school campers will learn parallel lessons between these activities and their own personal spiritual walk. It is easy to spend time learning and reflecting in God's natural world and to feel Christ's presence throughout the week. Tekoa Overnight (TKO) camps are organized in family groups. For High School Overnight Camp, each family group typically consists of 6-9 boys and 6-9 girls with a male and female counselor. This type of structure promotes strong camper-to-camper and camper-to-staff relationships. Family groups participate in all activities and meals together and are housed separately by gender in bunk style cabins or lodges. Depending on registration numbers, some family groups are single gendered. Family groups are organized by camper age and cabin mate requests within the High School TKO program.